Launched in 2003, Dubai Sports City has grown to encompass everything a sports enthusiast could possibly wish for, including state of the art academies in golf, cricket, hockey, football, swimming and rugby. Situated within easy access of Dubai’s major road networks and the rest of the emirate, Dubai Sports City has become a hive of activity, combining a sporting lifestyle with a thriving residential and commercial community. Dubai Sports City is also the base for the International Cricket Council’s (ICC) global headquarters and the International Cricket Stadium, which opened to huge acclaim in 2009 hosting Australia and Pakistan’s ODI series. With its capacity of 25,000, this eye-catching venue has attracted a worldwide audience of millions, becoming a top location for international cricket. Testament to its versatility, the International Cricket Stadium also regularly hosts major concerts and events. Dubai Sports City’s facilities include: The Els Club designed by golfing legend, Ernie Els; Butch Harmon School of Golf; DSC Football Academy; Swimming, rugby and hockey academies; International Cricket Stadium, ICC Global Headquarters and ICC Cricket Academy; Residential communities such as Victory Heights, Canal Residence and Gallery Villas. Champions Tower III is a 16-storeyed development offering a choice of 256 elegant units comprising of studios, one-bedroom and two-bedroom apartments. Champions Tower III nestles amidst the lush gardens and shaded paths of Dubai Sports City . With a premium location, Champions Tower III is a 5-minute walk from the entrance of the gated community and offers residents stunning views of the canal and the landscaped scenery. It is a few meters from world-class stadiums and academies, educational, religious and healthcare facilities, posh restaurants and cafés as well as a sports-themed shopping mall. The tower is a 2-minute walk from the 18-hole Ernie Els golf course and is in close proximity to the Manchester United Soccer Schools, ICC Global Cricket Academy, Butch Harmon School of Golf, David Lloyd Tennis Academy, World Hockey Academy and Bradenton Academy School. Occupying an area of 250,000 square feet, Champions Tower III is designed to promote a healthy lifestyle and offers a state-of-the-art health club, communal swimming pool, juice bar, steam, sauna and separate fitness gyms for men and women located on the rooftop and fully-serviced by a well-trained team. The tower boasts of 5-star hotel features and amenities such as a spacious fine marble lobby, 3 high-speed elevators, basement parking, covered parking on the ground floor, concierge and valet services, 24-hour manned security and an in-house maintenance team to ensure the comfort and security of occupants. Tired of a long drive to the office in traffic? Imagine leaving the house a mere minute before the start of your working day. The Bridge is the place where you can do just that. 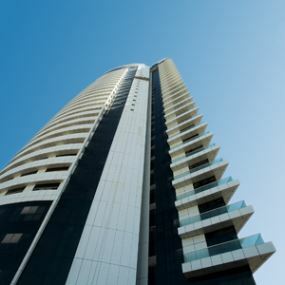 As one of the most unique developments within The First Group’s portfolio, this Dubai Sports City address features both residential and commercial property, making it a location that spells even more lucrative returns for all its owners. Fast becoming one of the most in-demand addresses to reside, work and enjoy life, The Bridge combines fully furnished apartments with four floors of state of the art serviced offices. Within months of its launch, The Bridge had completely sold out, catching the eye of investors such as former England cricketer, Andrew ‘Freddie’ Flintoff and footballer, Michael Owen. With a choice of iconic and minimalist in design turnkey apartments and penthouses, this is a truly enviable address. Indeed, thanks to their intricate attention to detail and cutting edge design features, the penthouses at The Bridge sealed a prestigious CNBC Property award for Best Residential Apartment. Leisure time at The Bridge is the envy of many, with a stunning rooftop ‘Sky Pool’ and state of the art Health Club. In addition, just minutes away lies an array of amenities, from Dubai Sports City’s many sporting academies, The Els Club Golf Course and International Cricket Stadium, to a choice of nearby restaurants, cafés and retail outlets. Need to head elsewhere in the city? The Bridge is superbly located within an easy commute from the rest of Dubai, via the emirate’s major road networks. The Bridge also marks the launch of an exciting new brand for The First Group in the form of SOLO – fully serviced office space. Whether you are a budding entrepreneur, an established business or a busy out of town executive, SOLO offers everything you need for a successful working day.